See also: Models made by people using Stella. "If you're unfamiliar with three-dimensional polyhedra, Great Stella gives you the chance to get acquainted – in the on- and off-screen worlds"
"You'll find that you can use the software with barely a glance at the manual, but that would mean only using a small proportion of Great Stella's features. This is quite a sophisticated program for those who want to go beyond the basics"
"I want everyone to know right off the bat that I am finding Great Stella the greatest program ever devised for the use of polyhedron model makers... What amazes me most is seeing the speed with which any one of the 75 uniform polyhedra and any of their duals can be instantaneously brought on screen using Great Stella... The ease with which I can zoom in and out and move all around in the Stellation Diagram is fantastic, then to view the Base Stellation immediately as well is something I have to call miraculous, i.e., wonderful... Finally the nets - wow! 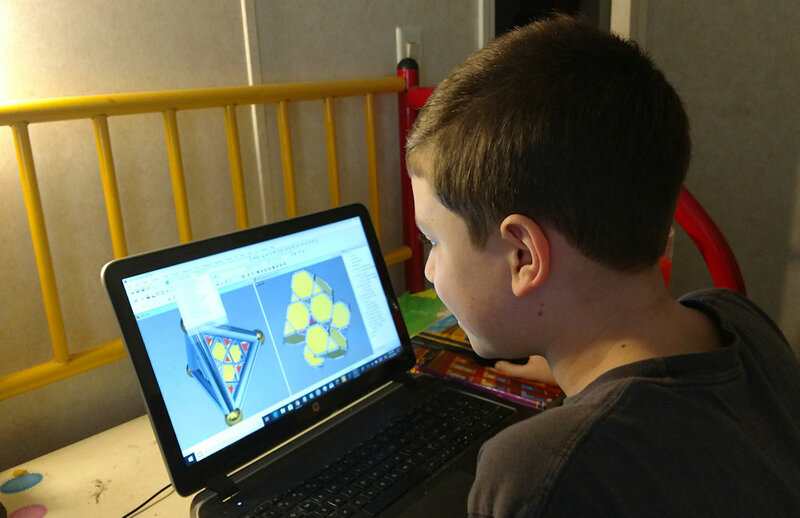 I can print them out to any size I want"
"For the pittance you charge for Stella, every person on earth that has ever looked at a geometric solid should have this program." "I spent a couple of days with Magnus Wenninger and he is your best marketing agent. His skill with Stella is truly impressive. I was ashamed to tell him I was back a level. Knowing that I work in computer aided design, he asked me what impressed me most about Stella. I told him the core elegance is in the data structure. So many byproducts come from it: veiws, nets, cell maps, etc etc. I have take my hat off to the cook... This program is a steal for what you get. Every college kid in math with a PC ought to have it. It is fabulous value." "You are a genius... I will tell everyone about yer work. It is the best of all the polyhedron engines"
"I love playing around with all of the beautiful objects you include in your library - and as a game developer, mathematician, and web developer/designer I feel like I can speak from a position of authority when telling you that your UI/UX experience is AMAZING and intuitive. I hope I can one day make something as easy to use as your software :-)"
"I am absolutely blown away by this program. I have been on it 10 hours a day since I purchased it 3 months ago." "Appears like a work of unadulterated genius"
"Utterly brilliant software... I have never used such brilliant and well written mathematical software as this, and I really can't praise it highly enough. I dug out my old copy of Coxeter's Regular Polytopes and it all makes a lot more sense!" "Beyond extraordinary! Thank you so much for this stroke of genius. Bucky left his body too soon, he would have loved Stella with a passion." "Nothing prepared me for the aesthetic experience of seeing hundreds of complicated facetings and blends, rotating in space in real time, and in stereo, essentially at a few touches of a mouse button, practically without having to lift a finger to actually draw or build them. This really brings home the notion that the uniform polyhedra are just little islands, which just happen to have all their edges the same length, in a vast ocean of isogonal figures." "Great Stella makes assembling nets of convex regular and uniform polychora almost child's play." "Constructing snid and grid facetings with Great Stella is like eating Lay's potato chips--you can't stop with just one." "Great Stella is a wonderful system and really should be on every polyhedron model-builder's computer." There is no sequence of still pictures that can convey the aesthetic experience of watching the changing sections of a polychoron of interest as it "passes through" our three-space, an experience that only modern computers can provide. I find it amazing that my computer is fast enough to perform the calculations to make a movie out of the sections of an intricate polychoron. When I made movies of the six convex regular polychora back in 1972, the 120-cell and 600-cell movies took nearly an hour of IBM 7094 computer time each. Sections in Stella4D are calculated in real time, and you can set them running perpetually using mouse inertia, bouncing from one extreme to the other. You can change the sectioning direction in midstream, and the "movie" just keeps running. You can also set the section tumbling as it's passing through, and/or view it in stereo. This is real luxury compared with what was available when I wrote my MSc thesis on computer polychora sectioning. ...I haven't had so much fun with a software package in years." "When I first started exploring polychora back in 1990, all I had was a pen and some paper - and therefore the best graphics I could play with were some hand drawn vertex figures and some sections of the simpler ones. Now only 18 years later, we have Stella4D - which can view all known uniform polychora (as well as many scaliforms and compounds and their duals!) as though a 4D being tossed the actual objects into our 3-D universe spinning and bobbing up and down as we see the sections in real time (although you may need more graphics power to handle the more complex ones) - its pure awesomeness - we can even use it to go inside hollow polychora to see their ever changing cavernous views - and to top it off, we can put on our 3-D glasses with the stereoviews and reach out and nearly grab the polytopes - this software is a must for any polychoronist! - I can't wait to see whats next for future installments of Stella4D." "Great Stella installed perfectly. Having spent a couple of hours playing, I would like to thank you for a brilliant bit of software. I know nothing about this facet of geometry (I am a statistician... simply attracted to pattern in any shape or form), but your program is endlessly surprising... something around every corner, and so many corners! My best (self-indulgent) purchase in years." "Thank you so much for the creation of your Stella Polyhedron Program. I've already spent countless hours of pleasure exploring and manipulating polyhedra." "Just a short message to say what an excellent package I think it is. I am very much enjoying using it - its in danger of becoming a bit of an obsession!" "Thankyou for your excellent Software. I have been looking for something like it for a long time! ... You are a legend!" "Thankyou for enriching the world with Stella." "I thought it was about time I dropped you a note and thanked you for a brilliant program. I used to build models the "hard" way, working out the nets, drawing a template etc, then by chance I came across your web page. I liked the look of the program very much, but felt it was quite expensive - for my pocket anyway. Eventually I gave in to temptation and purchased what was then version 1, and I loved it, upgrading to version 2 as soon as it became available. Now, having used it, I take back my thoughts about the program being expensive; it's been worth every penny." "The models in this program are truly awe inspiring. Watching them rotate and morph makes me feel I'm getting a glimpse of another dimension. Great Stella is the perfect tool for discovering some of the most beautiful hidden jewels tucked in an intricately mathematical part of reality. The program is a joy to use and runs extremely smoothly. I look forward to building models from the printed nets. I just love it! Thanks." "Stella is Rob Webb's astoundingly comprehensive polyhedron exploration application. Starting with an exhaustive list of polyhedra (including some I'd never heard of), he provides a mind-boggling array of operations to perform: dual, stellate, facet, augment. All aspects of the operations can be adjusted, then nets printed out to make models. If you have the time and the inclination, Stella provides an endless set of rabbit holes to explore." "After using your program for the last couple of days, I am truly amazed what can be produced." "I just wanted to say that I continue to be amazed at Great Stella - absolutely superb!!" "The best program I've ever seen for exploring polyedra. Recommended!... This program is fantastic! I thought I knew quite a lot about polyhedra, and I've never even seen any of the 'drilled' polyhedra. I also like the way you can explore duality through all the different manners, truncation, etc... Great program!" "I was printing off some nets last night ... I was extremely impressed with that section of Stella (which I hadn't used before). That's a fantastic piece of software you've put together." "I'm VERY PLEASED about the functions of the great stella program version. Indeed, it will be much easier for me to construct the most complex uniforms." "fantastic program! I am overwhelmed by the sheer number of stellations that exist"
"Your program is a pleasure to have and work with. The ability to morph forms, in many ways, simultaneously, especially after setting them into rotation, makes exploring the worlds of geometries that stretch between the still images we normally see a wonderfully rich experience - and possible. You must be very proud of it. The interactive folding of nets are wonderful. The choice of 3D viewing options (I do it cross-eyed) are satisfying. The color choices are also a pleasure." See also: Models made by users of Stella.